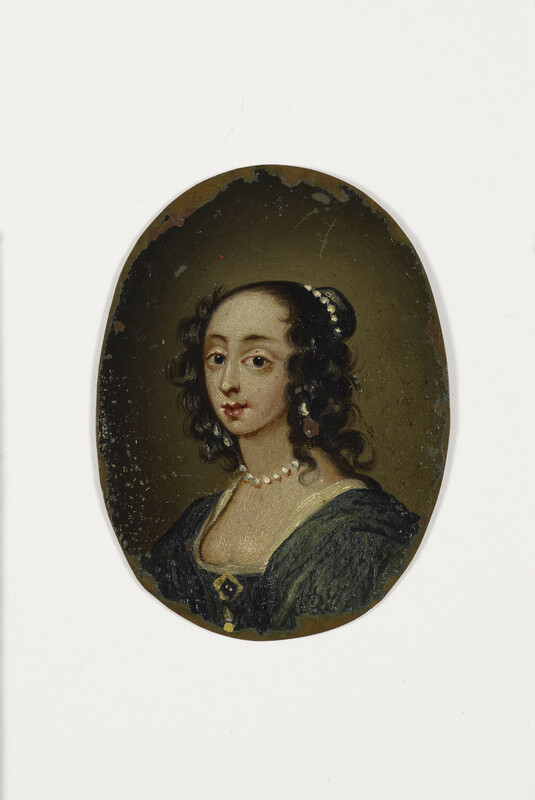 Set of mica overlays and miniature of Henrietta Maria (1609-1669) c.1650? 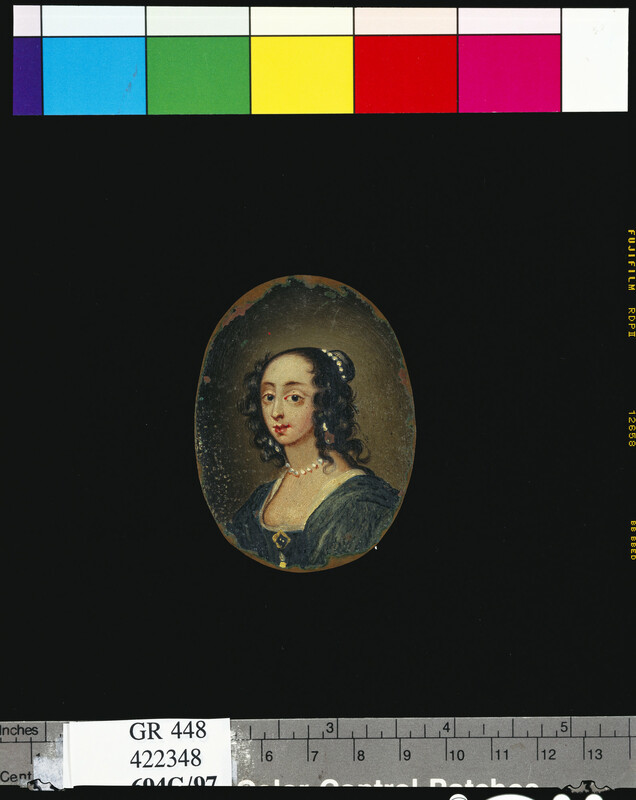 Master: Set of mica overlays and miniature of Henrietta Maria (1609-1669) Item: Portrait of Henrietta Maria c.1650? The mid-seventeenth century saw a vogue for an unusual type of miniature which could be dressed in a variety of different outfits by placing painted transparent overlays on top of the master image. Constructed from very thin slices of the mineral mica, these overlays included male and female outfits with appropriate accessories. When placed on top of the portrait, these semi-transparent discs transformed the costume and hairstyle of the sitter, creating a new composite picture, much like outfitting a modern paper doll. It seems likely that the purpose of such a set was to provide entertainment. Only around 45 of these miniatures with mica overlays have been recorded in museum collections across the world. Both male and female examples exist. While the identity of the female sitter in the Royal Collection example is unconfirmed, she has traditionally been recognised as the wife of Charles I, Queen Henrietta Maria. There is another example in the Royal Collection traditionally described as Charles I (RCIN 422098). Many of the other sets have also been identified as these two figures – a fact which probably demonstrates that they were considered commemorative items, distributed to promote the idea of the king as Martyr. The number of overlays in each set varies and some historians believe that a complete set would have contained up to 24 overlays. However, if this is correct, no set discovered to date has the full complement. In the example held by the Royal Collection there are 19 overlays. Although the various costumes in each set are not identical, there are commonalities between them and the costumes appear to fall into three groupings: seventeenth-century fashionable dress and accessories, exotic and fantastical, and regal and religious dress. Many of the fashionable accessories can be identified in the engravings of Wenceslaus Hollar and perhaps these served as models for the artists creating the overlays. Unsurprisingly headwear is a major area of interest and overlays include a variety of hats, feathers, veils, masks, hoods and caps. Both half and full masks were fashionable accessories and could be worn at masquerade balls, at the theatre or, on a more practical basis for to protect the fashionably pale complexion when outside. Dress traditionally associated with other countries is also included and these range from the millstone collars seen in Dutch portraits of the period to eastern-inspired attire Interestingly, although the base portrait in the Royal Collection set is of a woman, the overlays include male and female costumes. Nine of the nineteen overlays show Henrietta Maria in various types of contemporary female costume while the other ten show her dressed in male costume. It has been suggested that in higher circles of the Restoration court, women wearing men’s clothing was not a particularly unusual sight at events such as the courtly masque. Indeed, Henrietta Maria herself has been credited with introducing the travesti role to these courtly entertainments. The female riding habit, cut along the lines of male fashions and accessorised with traditionally male accessories like the ostrich-plumed beaver hat, also became an increasingly common sight during the seventeenth century. It is also interesting that the overlays appear to include clothes associated with widowhood, as well as an image apparently based on the well-known image of Cromwell in armour and small turn down collar. Given that the execution of Charles I was in 1649, these would have added a poignant element to a seemingly frivolous game.